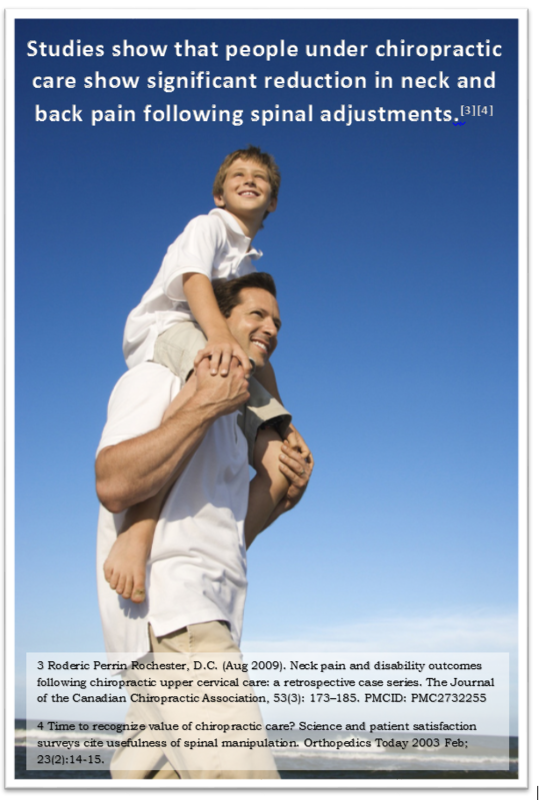 32% of adults suffer from neck or back pain. That’s way too many! That’s nearly 1 out of every 3 people! And to top that off… Americans spend at least $50 Billion per year on back pain. But does it really need to be this many? Do we really have to spend our money this way? Is there a solution to neck and back pain? 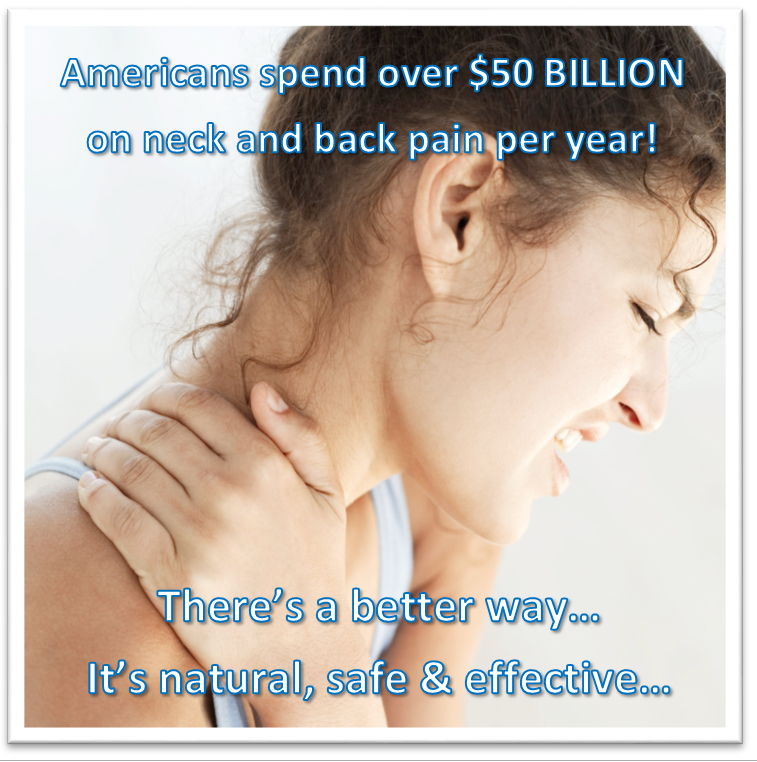 Or better yet… Is there a NATURAL solution to cure neck and back pain AND save us money in the long run? The answer is a loud and resounding YES!!! YES!!! YES!!! There is HOPE… and it is significant… and natural… and does not involve drugs or surgery. Most cases of back pain are mechanical or non-organic—meaning they are not caused by serious conditions, such as inflammatory arthritis, infection, fracture or cancer. This means that most neck and back pain is caused by mechanical imbalances, i.e. improper biomechanics, of the body. And this is the main focus of Doctors of Chiropractic – restoring proper biomechanics of the spine and associated articulations to restore optimal nerve function, maximum health benefits and improved quality of life. Studies show that people under chiropractic care show significant neck pain-level improvements following spinal adjustments. And an article published recently in the Journal of the American Medical Association also suggested chiropractic care as an option for people suffering from low back pain–and noted that surgery is usually not needed and should only be tried if other therapies fail. Physical, emotional and chemical stress can cause the bones of the spine to misalign, which can cause interference in the nervous system and affect the associated soft tissue surrounding the spine. These misalignments are referred to as subluxations and, when left uncorrected, can lead to aches, pain, low energy, poor sleep, and other chronic health issues. Chiropractors are the only health care professionals trained to work with the spine in order to locate spinal misalignments (subluxations) and associated imbalances, and make the corrections necessary to stabilize the spine and restore proper bio-mechanics and nerve function. At Clear Chiropractic all of our Doctors are trained in a specific, gentle and highly effective upper cervical chiropractic technique which does not require any twisting, cracking or popping of the neck. Through extensive exam procedures, they are able to identify, without a shadow of a doubt, if there is a subluxation present and create a plan of care that will help the patient achieve maximum benefits within the least amount of time. This precision exam and patient care reduces the number of adjustments necessary and helps contain costs for our patients. To find out if you, or someone you love, could benefit from chiropractic care click here to contact us now!